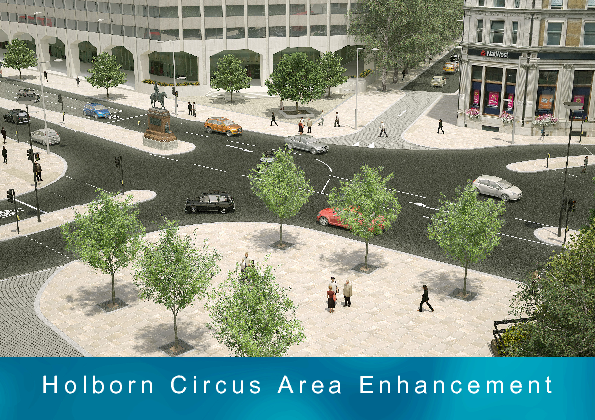 The new look Holborn Circus brochure landed in my inbox this evening. So far, this is all I've got. Plus an invitation to attend a public consultation on 3 March. It looks pretty. Whether or not it will make this junction any safer for cycling, who knows. I seem to remember a woman killed on her bicycle two years ago by a left-turning HGV. I also battle regularly with access to the junction on a bicycle. There is often simply nowhere to fit when you're on your bicycle trying to access the junction because all the traffic is queued up on the approaches with no space to pass the motor vehicles as they sit impatiently puffing out pollution. If it solves the approaches issue, that would be great. The feeder lane heading east along High Holborn works relatively well for that purpose. It's wide enough to keep motor traffic and you apart. So does the job. But from the looks of this mock-up, that still won't be the case if you're heading west from High Holborn. For the meantime, I'm going to try and get hold of more detailed plans. If anyone's interested in coming along, let me know. The invitation doesn't say what time the presentation will take place. I'd welcome any initial comments or suggestions on the somewhat limited information we've got so far. I cycle through this junction every day and it's my least favourite part of my commute. Generally motorists are patient and respectful here but the problem is there is just so MUCH traffic, it's a real capacity issue. In the same breath there is a LOT of cycling through put on this junction as three popular cycle routes converge here. Indeed, I once counted 42 cyclists pass through the circus on 1 turn of the traffic lights last summer. Let me know details of the consultation meeting once you have them and I'll see if I'm free. The picture makes it look nice and pretty, but a more realistic picture would have traffic queued across the junction and an HGV in the ASL. There is, however, lots of room on the paved areas for filter lanes that let cyclists bypass the lights altogether when turning left. (A cross between this and this. This would reduce red light jumping (because you would avoid the traffic lights) and increase junction capacity by some insignificant amount. I use this junction very early (05:30) travelling west from Holborn Viaduct and turning left into New Fetter Lane. Currently I find that due to the space on the road I get the usual delivery van nutters trying to overtake me on the junction to get ahead of me into the width restriction in New Fetter Lane. I think that for me this scheme may be an improvement.